Spinosaurus was first known from remains discovered in 1912 by German paleontologist, Ernst Stromer. Sadly, the fossils were completely destroyed in 1944 during WWII Allied bombing attacks over Germany. The detailed drawings and descriptions were salvaged, but without fossil specimen, size and weight are debatable. 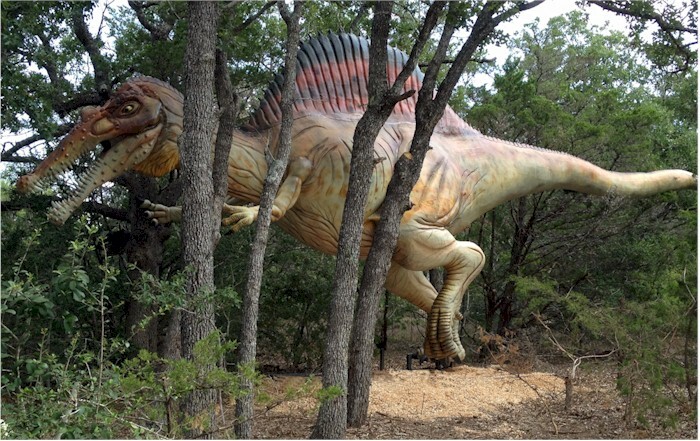 Spinosaurus was probably the largest meat eater ever to walk the Earth. Larger than both the T-Rex and the Giganotosaurus. The sail may have been a thermal regulator, releasing heat on hot days and absorbing heat on colder days. It also may have been used as a display to attract members of its own species and to scare other species. Spinosaurus had a 'fish trap' at the front of its snout; a cage-like array of small cone-shaped teeth that could hold slippery fish. Though he was adapted for hunting fish, he would have likely eaten small land animals too. In Jurassic Park 3, Spinosaurus wins a battle against the T. Rex. While this made for a good fight scene; in real life the T. Rex would have been the likely victor due to his jaw strength, and in reality, their paths would not have ever crossed since both carnivores lived on different land masses.